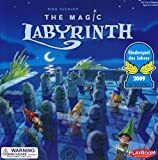 Each player tries to conquer the magic labyrinth with his token and to be the first to collect 5 symbols. First break out the magic symbols and place them in the black cloth bag. 1 Then carefully remove the remaining parts from the underground labyrinth. 2 They are not needed for the game. 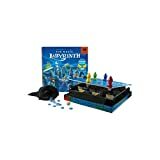 Place the box in the middle of the table and put the underground labyrinth in it. Then insert the wall parts. 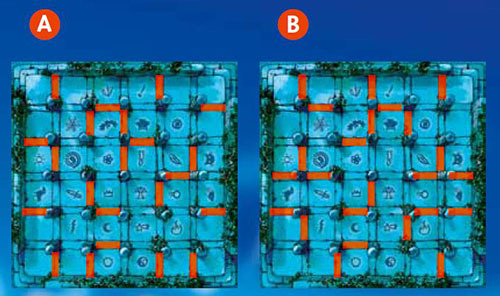 Illustration A (19 walls, easy variant) and illustration B (24 walls, a little harder) show how this may look. Important: Each field must have at least one entry. Surplus wall parts are put aside. When the labyrinth construction is finished, put the floor plate on top of it. The symbol chips in the cloth bag are put next to the playing field. Draw any chip and put it openly next to the playing field, so that everybody can see it. 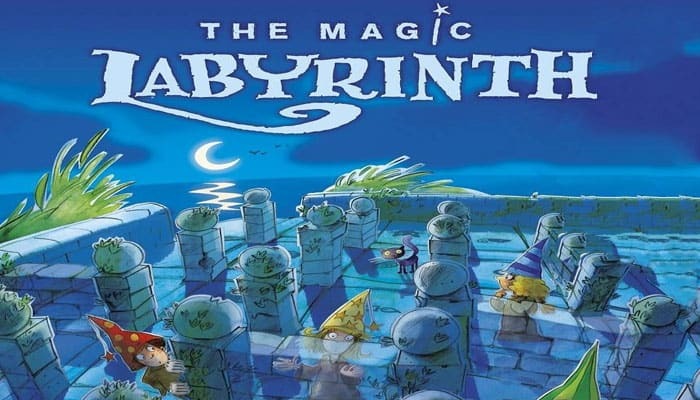 Now rotate the box several times and loudly proclaim: "Labyrinth, turn around, walls disappear, ways will be found!" Each player chooses a magician and takes a metal ball. 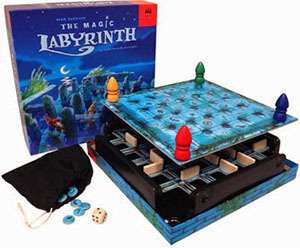 The game starts at the respective corners of the labyrinth, one player in each corner. If there are two players, choose opposite corners. Put your magician on the start field in the corner and then carefully put the ball against it from below until it is held by the magnet. You play by turns. The player who last lost his way begins. You now have to be the first to reach the playing field with the sign shown on the symbol chip. 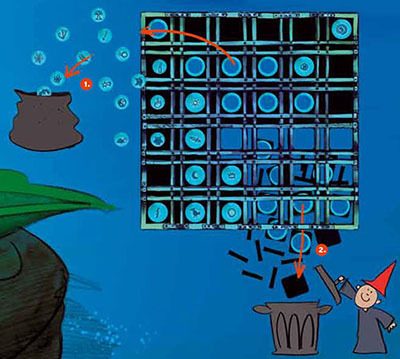 When it is your turn: Throw the die once and then move your magician in any direction according to the number of points (or less by forfeiting steps). Move your magician horizontally or vertically, and you may turn whenever you want. It is not possible to go diagonally. If you hit a wall, the ball will drop and land in one of the four corners. Remaining steps are forfeit. Remove the ball, and put your magician and the metal ball back in your starting corner. Tip: To remove the ball from the corner, place your magician on the side and slowly pull the ball upwards. 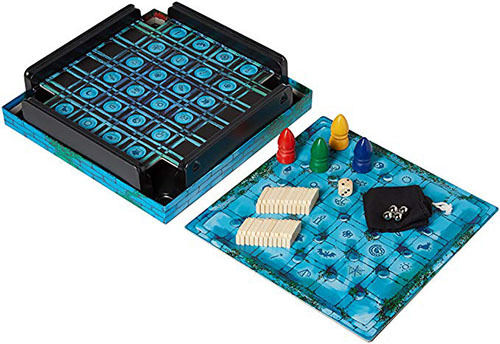 Then it is the next player's turn. When you reach the desired magic sym- bol on the playing field, you may take the symbol chip. Remaining steps are forfeit. Then draw a new symbol chip from the bag and put it down openly. A player is on the looked-for symbol already? He gets the symbol chip and a new one is drawn. The game is over when one player collected 5 magic symbols.